LONDON – A burning question in the wealth management proposition is who matters most to the client – the client advisor or the institution they work for? According to the latest global research into HNW client behaviours released by NPG Wealth Management, SEI and Scorpio Partnership, the acid test is the break-up moment. The results show that only 19% of HNW clients would pursue their relationship manager if they moved to a different wealth management firm. A further 17% would flirt with the idea of following, but would keep their options open. 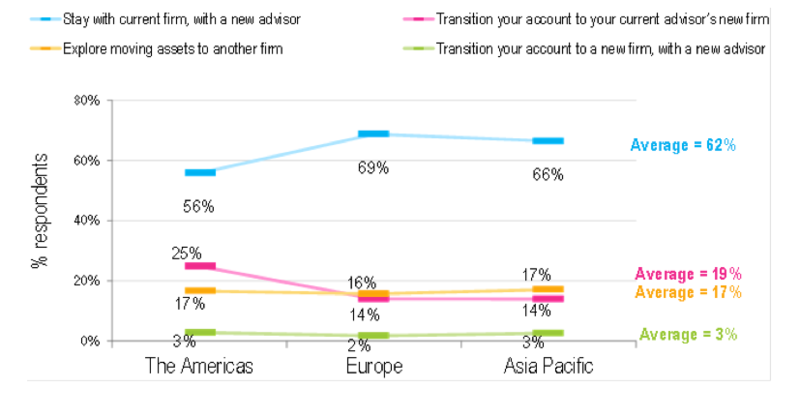 When asked their most likely response if their relationship manager transitioned to another institution, 62% of the global wealthy said they would choose to stay in the warm hold of their existing firm, meaning that in a majority of instances, the firm wins the heart of the client rather than the relationship manager. The findings are drawn from the first instalment of this year’s four-part Futurewealth series on the mechanics of relationship management. This paper, entitled Futurewealth 2015: The art and science of relationship management, explores how the client advisor is perceived by 3,113 of the global wealthy with an average worth of USD2.7 million. “The corporate bear hug is firmly gripping the client. Clients recognise that it is typically more than just the banker. However, it is a fine balancing act between the banker and the bank. Notably, for bankers with higher satisfaction rating scores, then the appeal of following the banker is still a relatively strong option among clients.” commented Sebastian Dovey, Managing Partner of Scorpio Partnership. This staying power is strongest in Europe, where 69% of clients would remain with their organisation and weakest in the Americas at just 56%. This does not mean that firms should get complacent about losing relationship managers. When clients rate their relationship managers as ‘very good’, there is an almost 50:50 chance of them moving on if that contact point leaves. Figure 1: If your current relationship manager were to leave your primary wealth management firm, which of the following would you be most likely to do? The role of the bankers continues to be hugely significant to the effective implementation of the proposition. Indeed, the research reveals that rather than simply being the face of the company the Futurewealthy believe the relationship manager has a very specific strategic function in supporting wealth creation. For 59% of HNWs, it is the direct responsibility of the relationship manager to improve their financial situation. For a further 42% and 37% respectively, the principal activity is to provide investment education and deliver market updates. Cultural nuances mean that this strategic role is accentuated in certain regions. In the Americas, for example, 42% of the Futurewealthy believe that the relationship manager should actually create their financial strategy. In Europe, where mentoring is more core to the function, this is lower at 30%. In Asia Pacific, there is more of a focus on receiving market updates. This strategic function is reflected in the qualities that are attractive to HNWs. Professionalism is the top rated attribute for a relationship manager and is important to 67% of Futurewealthy. This is closely followed by intelligence and integrity which are important to 57% and 52% of survey respondents respectively. Meanwhile qualities like sensitivity, sociability and empathy are considered important to less than 12% of respondents. “The findings demonstrate that the Futurewealthy have high expectations from their relationship managers. They hold these individuals directly responsible for their wealth creation efforts. It is therefore crucial that wealth management firms can support front line staff with the resources and insight they need on a broad variety of products and services” commented Marc Stevens, CEO of NPG Wealth Management. Figure 2: Within the context of your entire relationship with your primary wealth manager, what do you view as the main responsibilities of your relationship manager? On average, the Futurewealthy have been working with their current relationship manager for 10.2 years. In Asia Pacific and the Americas, these relationships have been slightly longer at 10.6 and 10.7 years respectively. In Europe, clients’ relationship lengths are slightly less durable but not insignificant at 8.1 years. HNWs who rated their wealth management firm as ‘very good’ had been working with the firm for 14.1 years while those who gave a ‘poor’ rating had shorter relationships of 10.4 years. The area for improvement is collaboration between the relationship manager and firm to provide access to the information and guidance needed to make informed investment decisions. 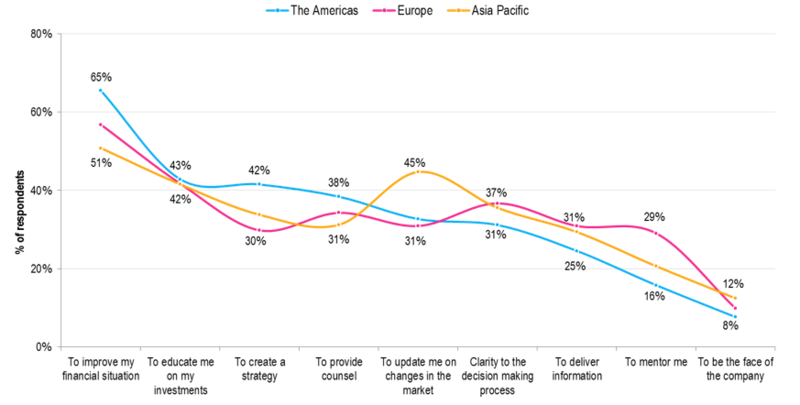 Almost half of our global elite feel this is amiss, rising to 51% of clients in Asia Pacific. In total, 3,113 individuals took part in this sixth global poll of the Futurewealthy. The average level of wealth among these individuals was USD2.7 million. SEI (NASDAQ:SEIC) is a leading global provider of investment processing, investment management, and investment operations solutions that help corporations, financial institutions, financial advisors, and ultra-high-net-worth families create and manage wealth. As of December 31, 2014, through its subsidiaries and partnerships in which the company has a significant interest, SEI manages or administers $625 billion in mutual fund and pooled or separately managed assets, including $253 billion in assets under management and $372 billion in client assets under administration. For more information, visit seic.com.